The new, long awaited, Sam and Max game was released last night and I had a quick go. 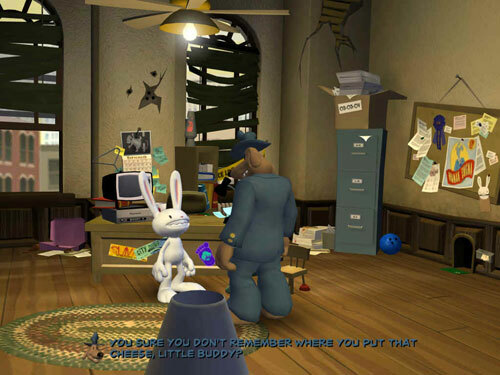 Those that fondly remember Steve Purcell’s dog and lagomorph crime fighting duo from the 1993 point and click Lucasarts adventure classic Sam and Max Hit the Road won’t be disappointed. I was rather apprehensive about their transition from pixelly 2D to 3D but Telltale have managed to capture the essence of the original very well. It’s easier to pick out the problems, so I’ll do that first. Firstly, I have a 1920×1200 LCD monitor which doesn’t support 1280×960. The problem is that if the game detects you don’t have 1280×960 it won’t let you scroll past it to select 1600×1200! There’s an interim fix on the forum (add a custom 1280×960 resolution using the nVidia control panel) but hopefully it’ll get fixed in a patch soon. There’s another little bug where sometimes the game lets the cursor leave the game screen area and it’ll escape to the Windows desktop, but I think this may be because I’m not running full screen yet. The voices, while no match to the original, aren’t too far off and I quickly got used to them; Max’s voice does seems to slip a bit from time to time though. Also, the camera often seems to adopt odd positions — I often found characters facing away from you while talking to each other; after I noticed it once I just kept noticing it! The point and click interface is very similar to Hit the Road though it have been simplified somewhat. There’s no right click to change the type of action; it’s just one click to use/walk/look at, etc. which may just be a case of getting used to. You also don’t seem to be able to combine objects in your inventory, and the biggest omission is the ability to “use Max”. In the original game you could use Max as an item, often with hilarious consequences. It’s a shame they’ve chosen to drop that. Talking of using stuff, what happened to the fun cursors? The new one looks far too operating system-y. Come on, let’s have Sam’s hand, uh, paw back! Lastly, I haven’t played it for long but the game seems a bit too easy. One of the first puzzles involves finding some Swiss cheese for the rat that’s stolen Sam and Max’s phone. The cheese Sam has isn’t Swiss cheese… but he has a gun (and no other inventory). It doesn’t take a genius to figure out the solution to that! That aside, it’s made me chuckle quite a bit so far and so I look forward to playing it through to the end and I’ll be back then to let you know what I thought. In the mean time, go buy a copy for yourself — or, at the least, give the free demo a try!